A couple of quick notes, both because I’ve got a big stack of books I’ve read cluttering up my desk, table, floor and mind, and because I want to go on with learning C++. Right, The Small Bachelor is a novelisation of a musical comedy Wodehouse wrote the book for, with Jerome Kern and Guy Bolton, namely Oh Lady. This heritage shows in many of the characters, like the small bachelor of the title, George Finch, who needs a lot of description of his exterior to convey the impression he must have made on the stage. 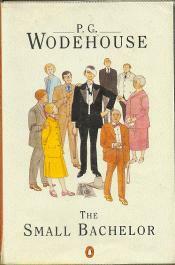 The story is curiously rambling for a Wodehouse, but it’s an early one. And some characters, like Hamilton Beamish the author of the famous Beamish Booklets (Read Them And Make The World Your Oyster) are delightful. Still, it’s galling that this is one of the few Wodehouses that I simply cannot read straight through; I have to skip. Next Next post: My camera recognizes her!